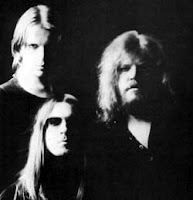 After Klaus Schulze left to do his own incredible solo work (post coming next week), Tangerine Dream spent 1971-1975 putting out their four best albums: Zeit, Atem, Phaedra, and Rubycon. Here's one track from each, because these songs are lo-o-ong. They're in consecutive order. When hearing this work, it's understandable that core member Edgar Froese started as a sculptor and apprenticed with Salvador Dali; it's wonderfully evocative, tactile and surreal. The Tangerine Dream that was to later make soundtracks for Risky Business and hundreds of other bad movies was a whole other deal (not worse, just different. I like their corny synthy stuff from the eighties as well). Risky Business would have just been another teen exploitation movie without Tangerine Dream's involvement. The story of an uptight, horny honky kid (feel free to use that as a band name) who temporarily convert his parents' home into a brothel is transformed by the music and the editing into a serious meditative experience. It manages to create a kind of cinematic experience which is the best of all: an experience which is difficult to explain or rationalize. It's a score that surpasses the content of the movie. I felt the same way about Jonny Greenwood's score to "There Will Be Blood".